Google Reverse Image Search On Mobile & PC: Reverse Image search allows us to search by image rather than the keyword. It gives best results when you have an image and you want to find the similar images on the web. So, you need to upload an image, and Google finds the related images around the web. Many other reverse image search engines are also available on the internet. But, most users use only Google. You can use “Google search by image” on both PC and mobile phones. By default, Google allows us to upload the image from the PC to find similar images. On a mobile phone, no option is available to upload an image. But, You can do a reverse image search on a mobile phone with Google image search results. Don’t worry, here we also write about how to do a reverse image search on a mobile phone by upload an image. How Does Google Reverse Image Search Works? First of all, you need to upload any image and Google gives the search results. If you are using a Chrome browser, then Google gives the inbuilt option to use this technique for web images. Google shows the similar images. Google also shows the other sizes (resolution) of the image. It also shows the websites link that includes the image. Uses Of Google Reverse Image Search? Well, most of the people are using this technique to find similar photos and high-resolution photos. But, you can use it for other uses. You can find the source of the image. If you have a low-resolution photo, then, It helps to find the high-resolution photo from the internet. You can find similar images on the web. You can find the web-pages or websites which stored the photo you have. It also helps to find the image creator. It helps to find the information about an image. However, the upload option available only for PC users. But, you can also do this on a mobile phone. It is easy to do a reverse image search on the PC. Because Google provides an option to do this. Below are the steps to do this. Open images.google.com link from any web browser on a PC. After that, click on the Camera icon (Search by image). After uploading the image, Google gives the results. Google doesn’t provide an image upload feature for smartphones. But, there are tons of third-party websites and apps available for smartphones. So, you can use any method. You need to open a third party website to upload the image and you get the results from Google. Open https://reverse.photos/ from your smartphone’s browser. After that, tap on the “Upload picture” option. Upload any image from your smartphone and tap on the “Show Matches” option. After that, Google gives the search results. There are tons of apps available for Android and iPhone. You can use any app for reverse image search/Search by image. Below are the apps for Android and iPhone. 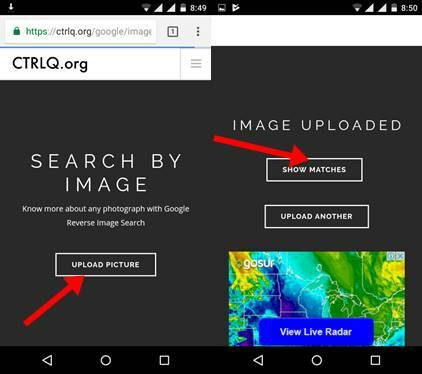 Reverse Image Search (Google) For Android Phone: This app is simple to use. Just open this app and upload the image from the gallery and tap on the search icon. Below is the link to download this app from Google Play Store. Reversee App For IOS (iPhone): Reversee app is for IOS devices. You can do a search by image with this app. Below is the link to download this app. You can also do this from image results or any image from any website. But, It works only on Chrome Browser. If you are using chrome browser on a PC then, you can do a Google reverse image search by right click on any image. Below are the steps for PC. Open any website or search for images on Google from Chrome Browser. Right click on any image and Click on the “Search Google for image” option. That’s all. Google gives the search results. Like a PC, you can also do this on a smartphone with Chrome browser. Below are the steps. Open any website or search for any image from Chrome browser. Tap and hold on any image and tap on the “Search Google for this image” option. Now it shows the search results. Search By Image is a great feature of Google. Though, there are many other search engines are available to do this. But, Google always gives better results than the other search engines. You can use any method to search similar images around the web.